What did people eat in the Middle Ages, and why and how did that affect cuisine and culture in later years? How did French cuisine become dominant? Where did American cuisine come from? How has food been used to control populations? What is the origin of specific cooking techniques? Throughout history, food has played (and continues to play) an important role in the development of a country's culture. 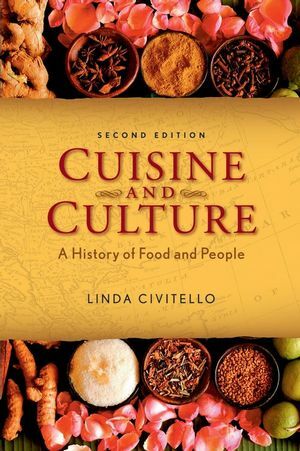 Cuisine and Culture: A History of Food and People, Second Edition examines the relationship between food and history from prehistoric times to the 21st century. From Rawto Cooked: PREHISTORY, MESOPOTAMIA, EGYPT, CHINA, INDIA. THE FERTILE CRESCENT: THE TIGRIS AND EUPHRATES RIVERS. CHINA: THE YELLOW (HUANG HE) RIVER. Grain, Grape, Olive: ANCIENT GREECE AND IMPERIAL ROME. Crazy Bread, Coffee, and Courtly Manners: CHRISTENDOM, ISLAM, AND BYZANTIUM IN THE MIDDLE AGES, 500–1300. CHRISTENDOM: THE EARLY MIDDLE AGES IN WESTERN EUROPE. THE EASTERN ROMAN EMPIRE: BYZANTIUM. CHRISTENDOM: THE LATE MIDDLE AGES IN EUROPE. Tea, Chocolate, and the First Cookbook: MEDIEVAL ASIA, THE AMERICAS, AND RENAISSANCE EUROPE TO 1500. COLUMBUS SETS SAIL FOR THE AMERICAS: 1492. The Columbian Exchange and the Protestant Reformation: SUGAR AND VICE IN THE SIXTEENTH CENTURY. Thanksgiving, Hutspot, and Haute Cuisine: SEVENTEENTH-CENTURY AMERICA, THE NETHERLANDS, RUSSIA, FRANCE. THE GOLDEN AGE OF THE NETHERLANDS. REVOLUTIONS—THE EIGHTEENTH CENTURY AND THE ENLIGHTENMENT. AMERICA: FROM COLONY TO COUNTRY. THE FRENCH REVOLUTION: "LET THEM EAT CAKE." From Coyotes to Coca-Cola: THE NINETEENTH CENTURY IN AMERICA. THE WEST: THE RAILROAD AND THE INDIAN WARS—1860s–1886. Sanitation, Nutrition, Colonization: THE NINETEENTH CENTURY IN EUROPE, ASIA, AND AFRICA. AFRICA ENSLAVED: WORKING FOR PEANUTS. INIDA: "THE JEWEL IN THE CROWN." ITALY: UNIFIED COUNTRY, REGIONAL CUISINE. TWENTIETH CENTURY IN EUROPE AND THE UNITED STATES. THE NEW IMMIGRANTS AND THE MELTING POT. PROGRESSIVES AND THE PURITY CRUSADE. DINING DE LUXE IN THE BELLE EPOQUE. WORLD WAR I AND THE RUSSIAN REVOLUTION. Prohibition, Soup Kitchens, Spam, and TV Dinners: THE ROARING TWENTIES, THE DEPRESSION, WORLD WAR II, AND THE COLD WAR. THE ROARING TWENTIES IN THE UNITED STATES. THE GREAT DEPRESSION AND THE NEW DEAL. POST-WORLD WAR II AND THE COLD WAR. Revolutions in Cuisines and Cultures: FROM "BON APPÉTIT" TO "BAM!" THE 1960S INTO THE NEW MILLENNIUM. THE SIXTIES: REVOLUTIONS IN COLOR. THE EIGHTIES: POLITICAL AND RESTAURANT REVOLUTIONS. THE NINETIES: THE RISE OF THE CELEBRITY CHEF. THE NEW MILLENNIUM AND THE FUTURE OF FOOD. APPENDIX C: MAJOR WARS AND BATTLES (NOT ANCIENT). APPENDIX D: SELECTED COOKBOOK AND FOOD BOOKS CHRONOLOGY.